The aroma is sweet with dried fruit and malt. On it's full and creamy body we tasted apples and sweet tropical fruits. Moderately sweet with chocolate, the flavors rounds out with a nuttiness that fades into black tea tones. The finish, while a little chalky, leaves you with dried fruit. The sweet and fruity aroma of this coffee is matched well with a medium smooth body. The flavor is nicely balanced, bringing a round and clean acidity. Sweet like sugar, the bitterness present is very low and has a soft tannic quality. When you take you last sip you're left with a soft fruity finish that lingers into a smooth and clean fade. We are head over heels for developing the nuances in each and every coffee we buy, artfully coaxing out the best characteristics of good coffee crops for you to enjoy. Messenger Coffee is committed to meeting coffee drinkers at every level. Categories: Coffee Ratings. Origins: Guatemala. Flavors: Apple, Black Tea, Chocolate, Malt, Mango, Nutty, Raisin, Tannic, and Tropical Fruit. Brew Descriptors: Balanced, Clean, and Sweet. 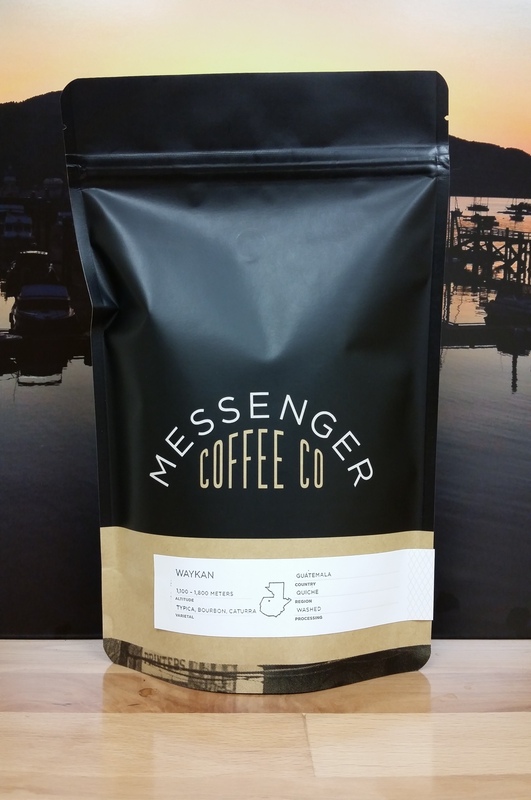 Roasters: Messenger Coffee.